Get the answers you need. Learn how to successfully plan, stage and perform a heroin addiction intervention. Heroin can be injected, smoked or inhaled by snorting. All three routes of admission will rapidly deliver the drug to the brain. Changes in the brain are initially characterized by uncontrollable drug seeking compulsions – no matter how severe the consequences. Physical dependence to heroin can occur quickly as it is a highly addictive opioid. Most abusers require a medically supervised detox to help reduce heroin withdrawal sickness. Heroin has repercussions that extend far beyond the individual. If you are unable to convince someone you care about to get help – or feel like you are losing them to a drug and/or alcohol addiction problem, Heroin Intervention Specialist Carmine Thompson and his Treatment Team can help. Intervention Specialist Carmine Thompson has a 98% success rate. He is clearly one of the most skillful interventionists in the field of addiction and recovery. For over 20 years, he and his treatment team have been helping families. Finding the right intervention specialist is the most important first step to ensuring the person you care about receives proper health care. Families, friends, employers colleagues and co-workers are encouraged to reach out to us. Trying to manage destructive behaviors and/or mental health related conditions without professional assistance can potentially be fatal. Addiction and mental health disorders are complex, and often pose challenges when it comes to the person accepting help, being properly diagnosed and following treatment plans. Aligning yourself to a qualified professional who understands the serious nature of a heroin addiction and the mental health related components many sufferers experience is critical. If someone you care about needs help, take the next step… Move forward – because without change – it will not get better. 2. Treatment needs to be readily available. Individuals who are addicted to drugs may be uncertain about entering treatment, so taking advantage of opportunities when they are ready for treatment is crucial. Potential treatment applicants can be lost if treatment is not immediately available or is not readily accessible. 3. 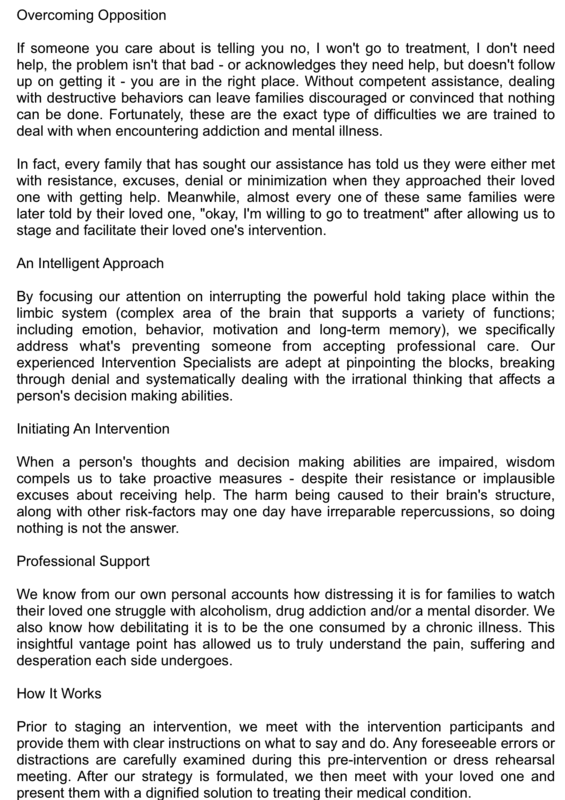 Effective treatment attends to multiple needs of the individual, not just his or her drug use. To be effective, treatment must address the individual’s drug use and any associated medical, psychological, social, vocational and legal problems. 4. An individual’s treatment plan must be assessed continually and modified as necessary to ensure that the plan meets the person’s changing needs. A patient may require varying combinations of services and treatment components during the course of treatment and recovery. In addition to counseling or psychotherapy, a patient at times may require medication, other medical services, family therapy, parenting instruction, vocational rehabilitation, and social and legal services. It is critical that the treatment approach be appropriate to the individual’s age, gender, ethnicity, and culture. 5. Remaining in treatment for an adequate period of time is critical for treatment effectiveness. The appropriate duration for an individual depends on his or her problems and needs. Research indicates that for most patients, the threshold of significant improvement is reached at about 3 months in treatment. After this threshold is reached, additional treatment can produce further progress toward recovery. People often leave treatment prematurely, so programs should include strategies to engage and keep patients. 6. Counseling (individual and/or group) and other behavioral therapies are critical components of effective treatment for addiction. In therapy, patients address issues of motivation, build skills to resist drug use, replace drug-using activities with constructive and rewarding nondrug-using activities and improve problem-solving abilities. Behavioral therapy also facilitates interpersonal relationships and the individual’s ability to function in the family and community. 8. Chemically dependent individuals with coexisting mental disorders should have both disorders treated in an integrated way. Addictive disorders and mental disorders often occur in the same individual. Patients presenting for either condition should be assessed and treated for the co-occurrence disorder type. 10. Treatment does not need to be voluntary to be effective. Strong motivation can facilitate the treatment process. Sanctions or enticements in the family, employment setting, or criminal justice system can increase significantly both treatment entry and retention rates and the success of drug treatment.